Chain’d Out™ from ALR Industries sets a standard for optimal performance supplementation. 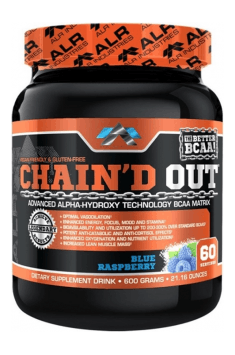 Chain’d Out™ allows everyone to enjoy supraphysiological and aesthetic results with Non-Hormonal Branch Chain Amino Acids (BCAA’s)! BCAA’s are the branch chain amino acids leucine, valine and isoleucine. Also note that all amino acids are derived from the assimilation of proteins. BCAA’s are not only 3 of the paramount 18-22 amino acids (as in your body cannot make them and needs them to live), they alone also make up about 70% of your muscle cellular pool and cellular structure. Unfortunately, BCAAs are lost (...muscle loss) at a rapid rate during training and during calorie deficient diets. The result is less muscle and the need to replenish these muscle mainstays…or better yet, trigger a muscle promoting environment that fosters nutrient super over-compensation where we need it- for accelerated muscular growth. Why else do we train? The true value of BCAA supplementation is now well established both in literature and in real world application. Mmuscle building stimuli are their true value rather than wasting good proteins to catabolism (muscle wasting) resulting in more money landing in your toilet. osobiście uważam, że to Najlepsze Bcaa na rynku! One portion (1 scoop) 10 minutes before workout, second right after workout. One portion (1 scoop) right after waking up. The dosage regimen may vary depending on the kind of exercise, its length and weight of the person using this supplement. To simplify, it's assumed that the optimum dosage of BCAA is 10g per day. It's best to take in two separate dosages: before workout (around 30 minutes) and after workout (even immediately), approximately 1g/10kg of body mass. On rest days it's recommended to use BCAA on an empty stomach and before going to bed. People who are trying to reduce fat tissue can adapt a similar dosage regimen as athletes. In the absence of contraindications, BCAA amino acids can be used daily. ALRI is a producer of diet supplements and nutrients, which are used by many athletes. In wide range of their products, you can find innovative fat burners, supplements enhancing metabolism and increasing production of nitric oxide, amino acids supplements and energy drinks. Malic Acid, Acesulfame-K, Sucralose, Natural and Artificial Flavors, Disodium Phosphate, Silica, Blue #1. Pre-workout supplement. Accelerates the synthesis of nitric oxide, improves vascularity and focus. Advanced pre-workout with versatile effect on exercise capacity, enriched with a vitamin complex.